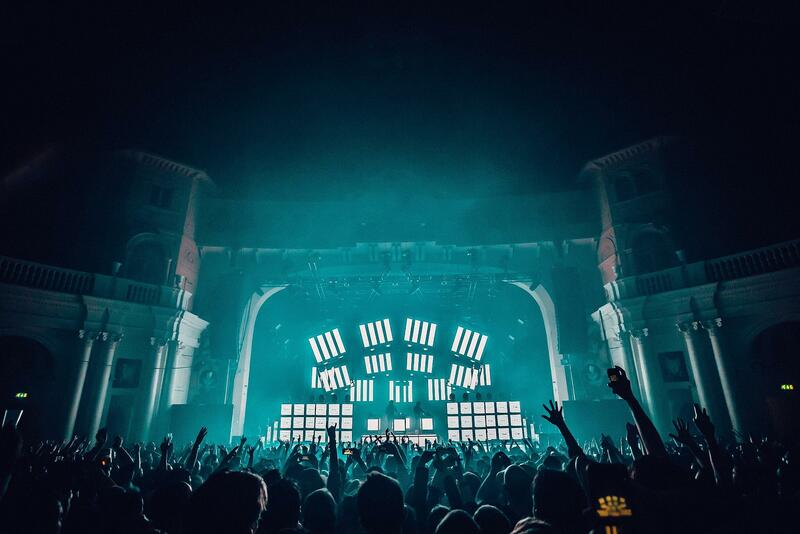 It's a warm, autumnal evening in south London and DJ Mag is on its way to Brixton Academy to see Justice perform live in the capital for the first time in four years. It's also almost 12 months to the day since the bosses of the crosses, Gaspard Augé and Xavier de Rosnay, released their third studio album 'Woman' to critical acclaim. Having toured their new live show at some of the world's biggest festivals including Glastonbury and Coachella, today's show will be their first indoor performance of the tour. 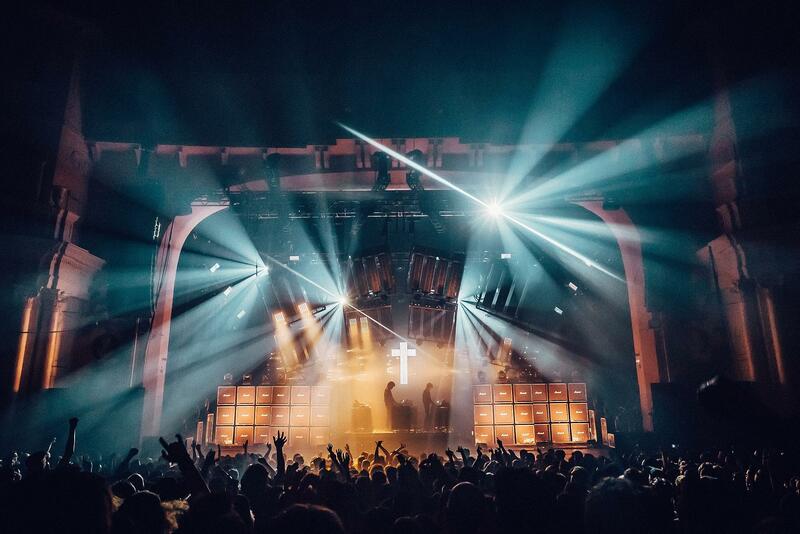 As we arrive at the venue at 8pm sharp, our biggest question is can Justice and their team deliver the same stadium-sized show in the relative confines of Brixton's academy? Outside the venue, there's a raft of people milling around, smoking, and making their way in. The Academy is almost completely full as we're greeted by Busy P, Justice's manager, who is warming up the crowd via a makeshift DJ booth just to the side of the stage. He's rattling through cuts of French electro, including Charlotte Gainsbourg's SebastiAn produced single 'Deadly Valentine' and Joe Goddard's remix of his own track, 'Genie'. It's now 9:15 pm and Busy P has finished his DJ set and is making his way to the sound engineer's booth as he passes us by alongside new Ed Banger signee, Myd. The atmosphere is now palpable and the temperature is almost unbearable, as Pedro Winter removes his jumper and gets ready for Justice's arrival. 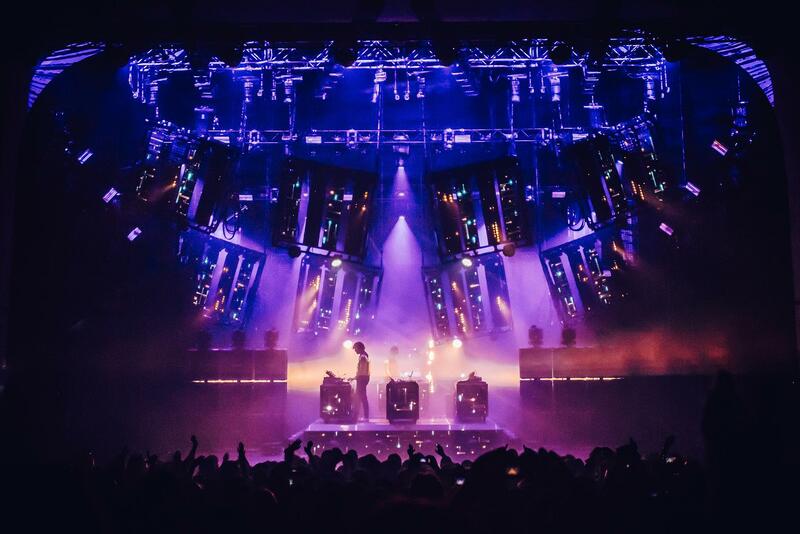 The lights dim and a celestial pattern flickers on the stage as Justice's galactic disco cut 'Safe And Sound' rings out to a roar from the crowd. De Rosnay and Augé are stood side onto the crowd, flanked by an E-shaped production set-up including four tables of synths — proof that this truly is a live performance and not just button pressing. Gone are the duo's iconic leather jackets and instead Augé and De Rosnay are dressed in tight-fitting jeans and Justice-embossed bomber jackets. The duo's new stage set-up is an evolution of their previous stage shows; you've still got the faux Marshall amps either side of a raised performance area, for example. The biggest addition is the eight banks of hydraulic lights suspended above the duo, that rise, twist and contort as the show develops. This is by far Justice’s most technologically advanced lighting set-up as the music segues from the doughy disco groove of 'Safe & Sound' into fan favourite 'D.A.N.C.E' and then into 'Canon', as the hydraulic lights — which look like exposed sun beds — lower above the duo's heads and bathe them in a beaming, bright white light. Throughout the show's hour and 30 minutes run time, Justice rattle through 22 tracks, across their three studio albums. Cuts from their latest album 'Woman' take centre stage as the prog-rock croons of 'Love SOS' bleed into the razor sharp 'Alakazam' and then into the galloping electro of 'Fire'. The crowd is playing their part too, belting out vocals and melodies in unison as Augé and De Rosnay move around their stage set-up in a laissez-faire manner, never looking flustered or under pressure. As the show heads towards the final crescendo, the lighting banks have now arranged themselves into a lopsided X, bathing the duo in a menacing looking red, as 'Chorus' is mixed with the gravelly banger 'Phantom 2' and 'Audio Video Disco'. Augé and De Rosney then disappear from view only to reappear on one of the balconies above and to the right, where there's a grand piano lit by ice-cool blue lights for the duo serenade the crowd from above with a rendition of ‘Chorus’. Once back down on terra firma, it's time for the proper encore which consists of 'Stop', 'Randy' and a Turbine version of 'D.A.N.C.E' played at breakneck, retina-burning speed. As with any Justice show, the final five minutes is where Justice show their appreciation for the crowd, fist-pumping fans, taking photos and De Rosnay's now iconic crowd surf — a moment of gleeful fan service as he pumps his fist to the Queen-inspired drums on 'Parade' from the duo's 'Audio Video Disco' album. As we make our way outside to a sea of dazed fans and t-shirt sellers, Busy P's declaration of a stadium disco show from a couple of years ago comes to mind and for us, it has finally come to fruition — proving once again that no one does it quite like Justice.